Many people believe that any type of yogurt is healthy. Unfortunately, this isn't true. There are number of varieties out there that are filled with excess fat, calories, and sugar. Still, yogurt is a great source of calcium and, when you choose the right type, it can be very good for you. 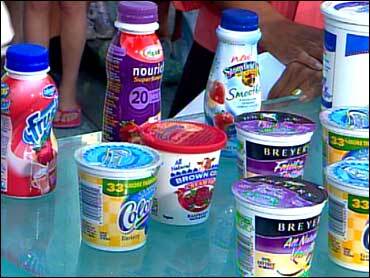 Registered dietician Keri Glassman, a Women's Health magazine contributor, helped make sense of yogurt labels on "The Early Show." But what are the common mistakes consumers make when choosing a yogurt? Glassman said they either don't look at sugar grams and choose one that is too high or they go for low sugar, but choose and artificially sweetened yogurt because they don't realize that all yogurt naturally has sugar. Shoppers may also look for fat-free options, but ignore the sugar content. Glassman said, "They ignore fat and sugar grams because they may only focus on the 'special' probiotic being highlighted on the package." She added probiotics can help to keep the digestive system in balance and functioning optimally and may support immune system function, especially when a person is taking antibiotics, which can wipe out intestinal bacteria indiscriminately. According to the Food and Drug Administration, in order for something to be called yogurt, it must contain these active cultures. In the U.S., Glassman said, these cultures are Lactobacillus bulgaricus and Streptococcus thermophilus. Some yogurts have additional cultures, but only the above two cultures are required. As far as the yogurt Activia is concerned, Glassman said, probiotics are naturally found in yogurt. There are products out there, she said, making larger claims based on their own specific probiotics. Not only do some of these have artificial sweeteners, Glassman said, but you are likely to get the same benefits from the "real" thing. Nonfat yogurt has less than 0.5 percent milk fat. Nonfat yogurt has the same nutrients as yogurt made with whole milk. Look for 20 percent of daily calcium. This is about 200 mg. This is the amount of natural sugar found in yogurt from the lactose. Note: if there is fruit added to the yogurt the sugar content will be higher. Look to see where the sugar grams are coming from. For example, real fruit versus refined sugar like high fructose corn syrup. Yogurt varies depending upon fat grams and added sugar. A benefit to yogurt is buying in portion controlled containers. If you are making the right choices and looking for lower fat and sugar options than you should get about: 15 to 20 calories per oz. So about 90 to 120 calories for a 6 oz. container. Glassman also took on another major yogurt issue: sugar. According to Glassman, it is important to know where the sugar is coming from in your yogurt -- from the fruit content or refined sugar? "If you are going to have sugar calories you want them to be the "best" sugar you can get," Glassman said. "Avoid high fructose corn syrup. And, I also recommend avoiding all artificial sweeteners." But what if your child eats one of these yogurts with the crunch on top. Is it better for them to eat this then not eat it? We know calcium is crucial for children, so it is important for them to get in -- sometimes even if it means getting a little sugar in, Glassman said. However, she added, this is why we need to start children off with good habits right from the beginning. If they are given lower sugar options from a young age, she said, they won't think yogurt with cookies is the norm. Start kids off with plain yogurt with fruit or naturally fruit flavored yogurt, Glassman said. Glassman said, "I know my kids spit out the yogurts that are artificially flavored and colored, because they just think they taste gross because they are not used to them." Still look for low fat/fat free versions with little added sugar! Fermented milk drink that may contain many varied strains of bacteria and yeast. If you do not like plain, flavor it up on your own to control amount and type of sugar. Nutmeg: May reduce inflammation and soothe and upset stomach. Is it worth it to buy organic yogurt? Even if your entire diet is not organic, it is worth it to spend the money on organic dairy, especially for children, Glassman said. She explained you will be avoiding hormones, antibiotics and also be avoiding artificial sweeteners and dyes at the same time. For more information on probiotics, go to Medicinenet and The National Center for Complementary and Alternative Medicine.